There is something about heist films and prison break films that appeals to engineers. It’s all the planning and problem solving involved. Like deciphering a puzzle or playing a complicated game. I know engineers that wouldn’t glance twice at 95% of everything I watch, but settled comfortably into conversation on the topic of heist and/or prison films. And it’s not surprising that the two subgenres go hand-in-hand, though it might initially seem like an arbitrary pairing. Both are based around careful preparations, patience, resourcefulness and, trickiest of all, trust. The big difference is that heist films are about breaking in, while prison films are about breaking out. The enduring popularity of capers and escapers has meant that whole generations have come and gone as the cycle waxes and wanes. That’s not unusual in itself, but amongst actiony genres like these there can be a certain tendency for audiences to fixate on the latest, big-budgetest star-studdedest examples to the exclusion of a long history of neglected cinema. The truth is that heist/prison movies don’t need to be big-budget (true of every genre, but it’s a harder case to make with, for example, sci-fi or war movies) and don’t particularly benefit from big-name stars, but try telling that to people who think prison films were born with “Shawshank Redemption” (1994) and that the genealogy of today’s heist films goes back no further than the 2001 remake of “Ocean’s Eleven” (no offense to either film, both of which I enjoy). The true genesis of heist and prison films, in the sense that we know them today, almost certainly lies in the field of film noir (I leave it as an exercise for the reader to trace it back to gangster films). And while I’d like to fire off a salvo of early examples well worth revisiting, that’s not quite today’s focus (well, really quick then: “Brute Force” (1947), “Criss Cross” (1949) and “Asphalt Jungle” (1950)). Instead, I’m going to gush about the French presence in the second generation. Some combination of foreign language, cultural amnesia and the usual preconceptions about French cinema, tends to suppress these masterpieces from wider popular attention in the US. It’s true that despite the imported archetypes and violence, a certain domestic Frenchness remains, its not nearly as alienating as skeptics imagine. In fact, the calling cards of this period have left their own influence on today’s crime classics so clearly that it’s taken for granted: taciturn antiheroes with stylish deportment, suspenseful sequences marked by technical detail and hushed dexterity and either a minute clue or a treacherous betrayal that unravels even the most foolproof of schemes. Some of the best include Jean-Pierre Melville’s “Bob the Gambler” (1956) featuring one of the best endings of any heist film and a brilliant performance by Roger Duchesne. Then there’s Jules Dassin’s “Rififi” (1955) with it’s nearly half-hour wordless jewel theft conducted without any relief from tension (viewers inevitably go silent themselves, lean forward and even sweat) balanced neatly by its gunplay-heavy blood-bathed fallout. For prison films, there’s Robert Bresson’s exquisitely efficient “A Man Escaped” (1955) about a Frenchman trying to escape a Nazi prison. Its minimalism not only lends weight to every scrape on the stone walls and every splinter in the wooden door, but it transcends the simple thrills of great escapes and makes the act a combination of ascetic ritual, existential parable and rebellious self-assertion all why retaining an undeniable realism (perhaps because Bresson himself was held captive during the war). Bresson’s masterpiece may be “Pickpocket,” but it’s a close call indeed. A few days ago I watched Jacques Becker’s “The Hole,” a magnificent prison film completed in 1960, shortly before the director’s death. I was slow getting around to the film after not caring much for Becker’s “Golden Helmet” (1952) and finding his heist film “Don’t Touch the Cash” (1954, better known by its French title “Touchez pas au grisbi”) a dignified, but somewhat lifeless entry (others disagree). 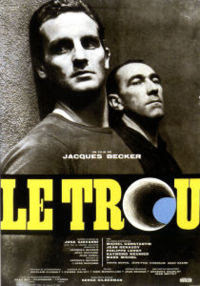 Becker, never a household name in the US, hasn’t been recognized to the same extent as Bresson, Dassin or Melville, so perhaps it’s not so surprising that “The Hole” spent a long time in exile before being revived by Criterion (who also distribute “Bob the Gambler,” “Rififi” and “Pickpocket”). The action begins in a cell of the overcrowded Sante prison where quiet meticulous Roland (Jean Keraudy, who led the real life escape), sharp organized Manu, tough prickly Geo and crafty optimistic Monseigneur volunteer to fold boxes to pass the time. Into their midst comes the young innocent (literally) Gaspard, who is serving a comparatively light trumped-up charge after a fight with his wife. Gaspard quickly catches on to the caginess of his cage-mates and inquires about their reluctance to accept him. After a quick debate they decide they have no choice but to tell him: they are planning an escape. “The Hole” is relatively long (132 min) for a genre movie, but it makes the most of its time by featuring a based-on-real-life escape with so many phases it seems doomed to collapse on itself at every step. The five men will have to break through the floor, file off metal bars, learn guard routes, build jointed dummies, pick locks, sneak, crawl, climb and dig a tunnel through solid concrete before they can see the light of freedom again. And, of course, it won’t be as easy as that sounds. The plot is especially enticing for the demographic I mentioned in the opening, who like all the clever little touches and quick-witted ingenuity. It might be a prisoner standing on the shoulders of his partner to hide behind a column (and rotating around it while the guard does his rounds), an inspired way of passing mail between the widely-spaced heavily-barred windows using twine and brushes, or the social engineering decision to draw attention to themselves even as the escape draws nigh so as not to seem as though they are trying to avoid attention. All this leads to the sensation that the film wasn’t written by an intelligent screenwriter locked in an under-furnished tenement with nothing to think about but how to work a romance into the plot so that it will sell; it feels like it was written by an intelligent prisoner locked in a cell with nothing to think about but escape. That’s the way it should be. Shot in black and white, “The Hole” has something of the dry restraint and attention to detail that makes the “A Man Escaped” so taunt and lean, but the larger cast allows for carefully modulated dialogue, the interplay and clash of personalities and a greater emphasis on the camaraderie and trust integral to a five-man mission. Each inmate has to carry his part of the load, with the experienced Roland taking the lead, but they don’t always agree on how to proceed. One senses the both the hope and fear rise as they get closer to their goal and the mounting dependence on luck, and their unity, to succeed. Becker’s directing is impeccable, the cinematography is both beautiful and raw and the lighting is a perfect example of how to keep an audience straining into a nearly-convincing darkness without inflicting blindness or frustration. Yet what is probably best remembered about the film, aside from the plot, are the outstanding performances by both professionals and non-actors alike. Jean Keraudy lends a lot of authenticity, and the cast picks up on his lead in underplaying their parts. Even Monseigneur, who would have been a comic relief character in a lesser film, manages to be upbeat without a hint of obnoxiousness. Geo, who has to deliver some of the hardest lines to demonstrate his latent misanthropy, steers thankfully clear of being a personality-handicapped prison bully and puts in some really surprisingly nuances. Meanwhile, Gaspard gives us a likable centerpiece whose naivety is as dangerous as it is charming. In fact, there’s really no villain figure to help artificially align our sympathies. There’s no sadistic guard, corrupt warden, vindictive kapo or thuggish gang-leader to make our protagonists seem heroic by comparison (in fact, several guards and especially the warden seem fairly pleasant and understanding). All five of the leads really did do something morally wrong, and four of them unambiguously deserve to be in jail. It is only through their escape attempt that we come to see these men as sympathetic humans who possess integrity, teamwork and diligence. “The Hole” is everything a prison movie should be and a whole lot more than we usually expect of them. It may not have the fan clubs that “Shawshank Redemption,” “Bridge Over the River Kwai,” “The Great Escape,” “Escape from Alcatraz,” "Papillon" or “Stalag 17” have, but it sure deserves to. Four prep school students decide to ditch the weekend field trip and hide in an abandoned bomb shelter to party and hang out. Before long, they discover that they're locked in. As the hours turn into days, their suspicions grow, and they find themselves in a desperate fight to make it out alive. What began as a spontaneous lark could turn into a case of cutting class … permanently! Katie actually saw that (the 2001 The Hole) and says it's really pretty bad but kind of twisty. Keira Knightley is in it, which apparently people care about. As perhaps an even more curious sidenote, "The Hole" (1960) is not only my favorite Jacques Becker film, "The Hole" (1998) is also my favorite Tsai Ming-Liang film. The 1998 film is a post-apocalyptic tale about isolated apartment tenents falling in love through a hole in their floor/ceiling and slowly giving way to a disease that makes people behave like cockroaches, which is fitting since they are experiencing a trash crisis (look for bags of garbage falling through the sky in the backgrounds). Did I mention it's also a lip-synched musical? And that the title in the original Taiwanese is "Dong"? Nice Review- Hopefully I'll have a chance to check this one out (I review foreign films as well). I very much agree about "Elevator to the Gallows" and second your recommendation. Louis Malle tends to be a safe bet for me with directors (although I'm surprised at how many prominant critics thought otherwise) and his early underrated noir is certainly an interesting change of pace from his more nostalgic and romantic films. Jeanne Moreau is a nice plus, too. "Poor Gaspard" is one of my favorite movie lines of all time. It's such a perfect line, and the last thing I was expecting at the moment it was delivered. Really makes you see the scene in a different way. I forgot Papillon, so I added that into the last paragraph.